A jealous husband has set himself ablaze over an allegation of his wife. According to sources, this incident has led to serious anxiety among residents of the area as the inferno spread to other apartments as properties worth millions of naira were said to have been destroyed in the process. The man had in the weeks past threatened to kill himself after his wife was reportedly caught pants down with one his male messengers in the area. The man came home last week and locked himself and poured fuel on his body and thereafter light himself where he burnt beyond recognition before help could come. “Some few weeks ago, his wife, Blessing was caught pant down by their neighbours with a young boy who washes the Keke of the man. The boy is one of the boys whom he usually sent on an errand in the area. 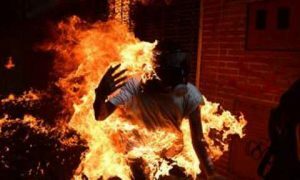 Though the wife has since left his apartment, the man returned home that day, poured fuel on his body, barricaded himself inside his apartment with an iron bar and set himself ablaze”, the source said. When the fire broke out, a neighbour ran to where the fire started from, broke into the apartment and tried to rescue the victim who held on to a chair and insisted that he wanted to end his life.His action during the inferno that claimed his life fuels the suspicion that he may have set the house on fire by himself to reinforce the suicide argument.